As the premier portal to Minnesota history, the Minnesota History Center uses the past as a lens to focus on current events and community issues. This is a place of learning and discovery, a place to make new friends and meaningful connections. All are welcome. The gallery is dedicated to exhibits on socially responsive topics and issues that are relevant to Minnesotans today. Exhibits are co-developed with local community groups and students. Green Card Voices explores stories of the diverse immigrant population that has shaped the Twin Cities. 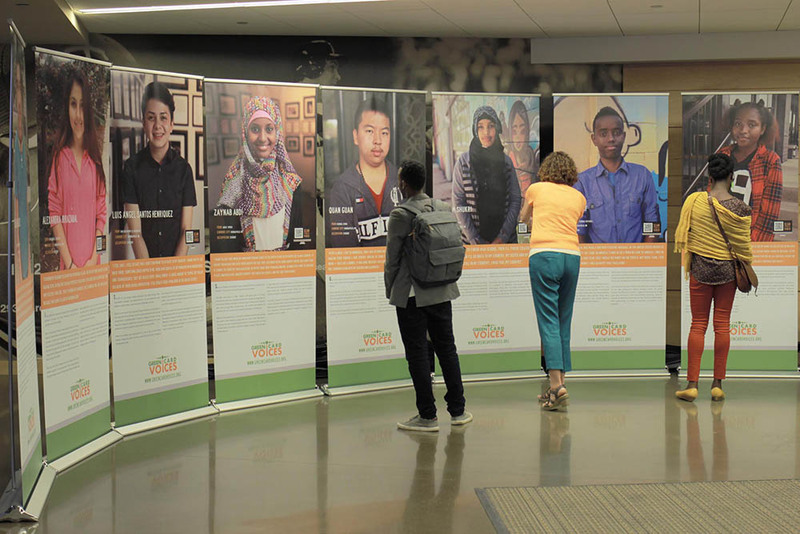 Featuring immigrants from 22 different countries, this exhibit tells stories of coming to Minnesota from countries all around the world. The participants represent a diverse range of professions and ages and arrived in Minnesota through many immigration routes, including as refugees, DACA recipients, and through family reunification, but they all share one important trait: They now call the Twin Cities home. Stop outside the Irvine Community Gallery and tell us why your history matters. Fill out a card and use your phone to take a photo or make a video. Record your memory and share it with the world on social media using the hashtag #MyHistoryMatters. Together, our stories weave a tale that is uniquely Minnesotan, and highlight a history that shapes us all.